This exhibition ran from May to September 2012 and was produced by Manuscripts and Special Collections. The exhibition was curated by Dr Andrew Harrison, Director of the D H Lawrence Research Centre at The University of Nottingham, and staff in Manuscripts and Special Collections. D H Lawrence provides an endlessly fascinating subject for both biographers and the general public. Controversy began during his lifetime, with family, friends and literary critics divided in opinions about his character and creative genius. Since his premature death in 1930, aged only forty-four, his life and work has been subject to continual re-evaluation. Events like the 1960 obscenity trial, which vindicated Penguin’s publication of Lady Chatterley’s Lover, helped to make Lawrence a household name. In the last fifty years, fresh evidence about his life and the influence of his work has helped to introduce new audiences to new interpretations. 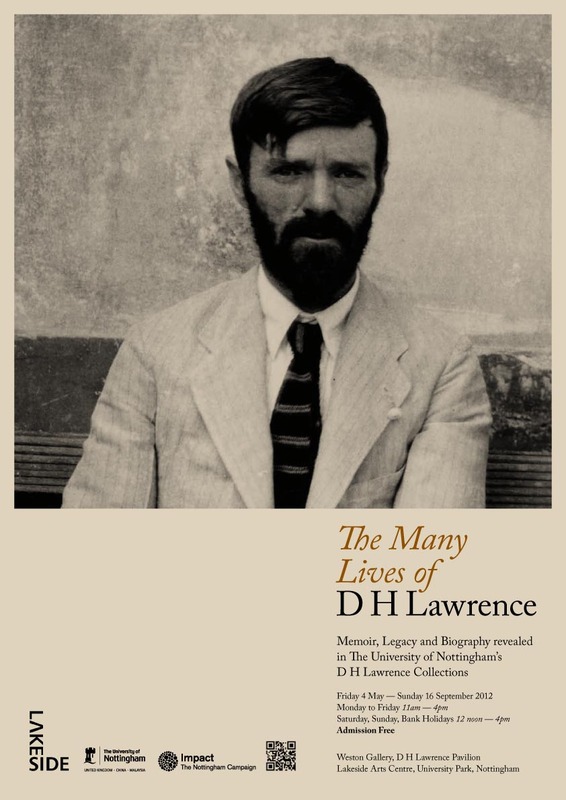 The Many Lives of D H Lawrence drew on the rich Lawrence Collections at the University of Nottingham. It charted the creation and steady extension of Lawrence’s story, as seen by himself, his family, contemporary friends and critics, later biographers and readers, and the general public. Eastwood and Nottinghamshire feature both in the making of his identity and the establishment of his local reputation, but the exhibition also showed the influence of stage and film, festivals and broadcasts in the creation of his iconic status. Two videos featuring Dr Andrew Harrison and Lawrence biographer Professor John Worthen are available on The University of Nottingham's YouTube channel. Emeritus Professor John Worthen, in conversation with Dr Andrew Harrison, discusses the question of Lawrence and biography in the context of the Lakeside exhibition 'The Many Lives of D H Lawrence'. Emeritus Professor John Worthen is interviewed by Dr Andrew Harrison about his work as a biographer of D H Lawrence. Click on the poster above to open a larger version. A fascinating, scholarly and meticulously curated exhibition. Extremely interesting, a real sense of regional pride. Enjoyed immensely and it made me feel proud to be a student of the city. Very nice exhibition! Thank you. Made me feel that I want to read one of his books!